You can check out the original recipe at Oh Dear Drea! My adapted version, which I shared in my demo, is down below. Note: I start making the sauce in a separate pot as soon as I set the pasta water on to boil. If you want to use the same pot for everything, start making the sauce when you drain your pasta. Prepare pasta as directed on package, and set aside. In a large, heavy bottomed pot, warm a teaspoon or two of olive oil over medium heat. Add the onion and saute, stirring occasionally, until softened and beginning to brown. Note: Some people like their pasta to have a lot of sauce, and some do not. Let this guide you when deciding how much pasta to cook. Gluten free substitutions are included in the ingredient list below. Prepare the pasta according to package directions until al dente. Remove two cups of water from the pot – this is where a Pyrex measuring cup comes in handy! Drain the pasta and return it to the pot; cover to keep warm. If using gluten free pasta, rinse under very hot water a couple of times to remove excess starch. Lightly oil if necessary to prevent the pasta from sticking. Combine the reserved cooking water with the cashews and blend until no grit remains. Add the rest of the ingredients (nutritional yeast through salt) and blend on high speed until completely smooth. Season to taste with salt and white pepper. Transfer the sauce to a large, heavy-bottomed pot and bring to a simmer over medium heat. Adjust heat to keep the sauce at a low simmer and whisk continually until thickened, about 3 to 5 minutes. Remove from heat. Add the sauce to the cooked pasta and mix gently until the pasta is evenly coated. Serve hot. By popular demand, the Triangle Vegan Pledge will kick off a fall vegan pledge this Saturday, November 2nd! Pledge participants and mentors will enjoy food, film, fun, discussion, and life-changing inspiration for 5 weeks, with weekly meetings hosted by the UNC Law School. The fall pledge will conclude with a vegan potluck and final Q&A. Check out the schedule of meetings, and contact us if you are interested in signing up for this or future pledges! I’m sure most of our pledges will recognize our peerless baker and vegan chef, Linda Nelson! In addition to baking for almost all of our pledge meetings and presenting two of our popular Pledge cooking demos, Linda was kind enough to star in our debut video demo! In this cooking demonstration, Linda is making a cashew-based vegan cheese sauce while offering us her thoughts of veganism and animal rights. The full recipe is below. Try it with macaroni & cheese, baked potatoes, grits, or veggies! A special thanks to James DeAlto for filming! 12 to 16 ounces elbow macaroni, cooked. * I always add about 1/4 cup of my homemade dijon mustard though a commercial brand would work well, if you choose to add it. Place cashews in large-sized bowl of the food processor and finely grind. Don’t, however, allow cashews to turn to paste. Add nutritional yeast, onion powder, salt, garlic powder, and white pepper. Pulse three more times to blend in the spices. In a heavy saucepan, combine milk, cornstarch, and oil. Bring to a simmer over high heat. Decrease heat to low-medium, cover, and simmer, stirring occasionally, for 10 minutes, or until thickener dissolves. With the food processor running, gradually add milk/oil mixture to cashew/nutritional yeast mixture. Blend for 2 minutes, or until smooth and creamy. Next, blend in miso and lemon juice. Combine cashew cheese with macaroni and serve. You also may bake it (I always do). To make the baked version: Preheat the over to 325. Transfer the macaroni mixture to a baking dish. Cover and bake for 20 minutes, or until heated through. Uncover dish, and sprinkle 1/2 cup herbed bread crumbs or cracker crumbs on top. Continue baking, uncovered, for 15 to 20 minutes, or until topping is golden brown and crisp. Serve hot. Jenny Brown, founder of Woodstock Farm Animal Sanctuary, visits the Triangle! 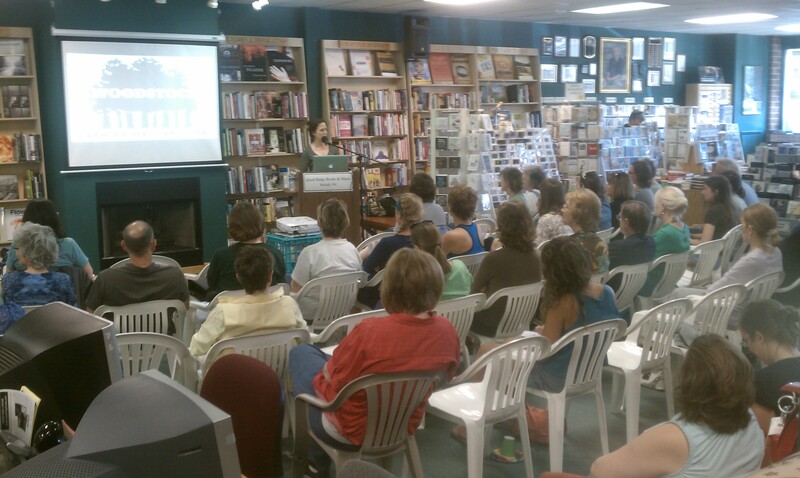 This weekend Jenny Brown, co-founder of Woodstock Farm Animal Sanctuary, visited Quail Ridge Books in Raleigh to discuss her memoir, The Lucky Ones: My Passionate Fight for Farm Animals and then stopped by the site of the future Piedmont Farm Animal Refuge! 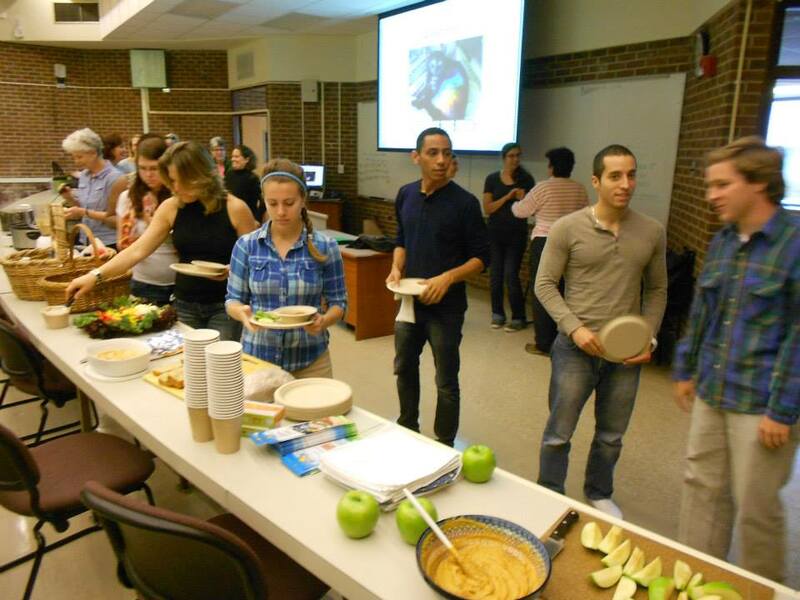 Thanks to the Triangle Vegan Club and especially to 2013 Pledge Linda James for making this happen! Brown’s memoir is a candid, wry look back on her evolution from casual meateater to passionate animal rights activist. She and her husband Doug founded Woodstock Farm Animal Sanctuary in 2004, and since then it has grown into one of the most successful sanctuaries and vegan outreach efforts in the country. Woodstock has rescued hundreds of animals from neglect, abuse, and slaughter while educating the public about factory farming and animal exploitation. After explaining the misery of factory farms to her audience, Jenny told much more hopeful stories of the animals that escaped and made their way to her Woodstock sanctuary, like Petunia, Patsy and Judy, and Dylan. Jenny’s presentation was a galvanizing reflection of each individual’s ability to refuse to participate systematic injustice simply by going vegan. In The Lucky Ones, Jenny frequently quotes the German theologian Albert Schweitzer, who famously wrote “Think occasionally of the suffering of which you spare yourself the sight.” Sanctuaries like Woodstock not only save hundreds and even thousands of animals, they show us all the peaceful, joyful existences animals can live once freed from the unnecessary suffering we consign to billions of others. As daunting as those numbers can be, remember: We can change that! Go vegan today! Big news! The Triangle Vegan Pledge is year-round now! We’re very excited to announce that we’re expanding the Pledge into a year-round program! We’ll still be holding our traditional Pledge every year, but this new format will allow us to reach more people. How does this new format work? Instead of meeting as a group every week, each new Pledge will meet with his or her mentor individually four times over the course of a month, in person or via skype. We’ll work with new Pledges to develop meal plans and we’ll provide participants with new resources every day to make this transition simple and meaningful. We’ll talk about health and nutrition, environmentalism, ethics, cooking, and the day to day life of a vegan, just like our yearly Pledge! Sign up now! Sage-Infused Pear Butter from the canning demo! 1. Peel core, and coarsely chop pears. 2. Place in wide pot with 1/2 cup of water. Bring to a boil, then simmer until pears are just soft. 3. Sauce the pears with an immersion blender right in the pot. Alternatively, sauce them in a standing blender, then transfer back to the pot. 4. Put the heat on low and add sugar. Stir until sugar melts. 5. Add the ground white pepper and whole sage sprigs. Turn heat up and bring to a boil. Be sure to cover with a lid or splatter shield. 6. Boil, stirring frequently when it begins to thicken. It will take about 35-45 minutes to reach a spreadable thickness. You will know it’s done when you can glide your stirring spoon across the bottom of the pot and see the bottom for a second or two before the butter melts back over itself. **Just when you begin to cook the sauce down you can prepare you canning pot and sterilize your jars. 7. Once desired thickness is reached remove the sage sprigs. 8. Fill jars and process in a hot water bath for 5 minutes. Store in a cool, dry place for up to one year. Any jars that did not seal need to be stored in the refrigerator and used within a week.